It was a frightening ferry ride Wednesday night for hundreds of Staten Island commuters. The ferry slammed into the dock, injuring 15 people. How different on a sunny day! On Tuesday we did quite a lot of things. 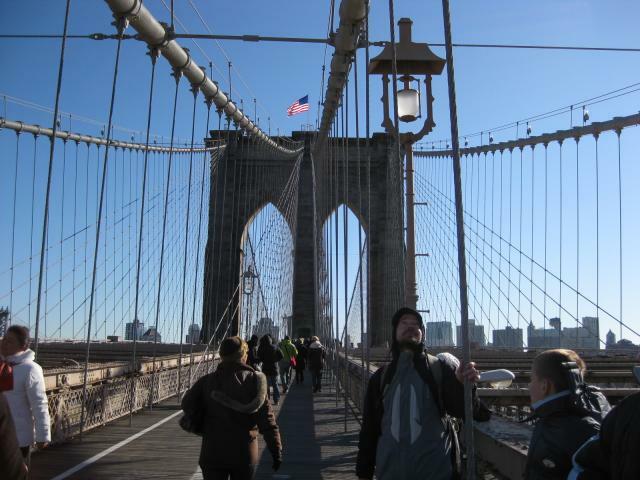 For starters we visited Brooklyn Bridge which was cool. Then we went to Central Park, which was huge. Dieuwe, Anne Roos and me all iceskated there which was cool although they only had figure skates. Then we visisted Trump Tower, which was an awesome experience, we even had some Trump Ice which was delicious. Then we walked around Time Square which was really, really busy. We had McDonalds there as well. Then we went to the hostel again and slept. On Wednesday we tried to visit the Statue of Liberty but it was so busy that we didnt do it because we had to wait for 1 and 1/2 hours and then we couldnt even get inside it (it was not worth getting close to it because our ferry passed it every day). Then we went to Time Square again and placed around it. Anne Roos and Mum went to go shopping for cloths while Dieuwe, Daddy and me went shopping for shoes (which we couldnt find) and for books (which we did find and we bought a couple). Then we met up again at 3 o'clock at the Museum of Natural History and then we went over to ChinaTown where we had some very nice Chinese food. Then we went back and went to bed early as we needed a good nights rest for tomorrow (because we leave then to Amsterdam). On Sunday we went to this really cool church, we meet lots of new people, we also went to this families house, they also invited other families, we had a really nice lunch there. On Monday we left our hostel and brought our rental car back, and went to staten island, we took the long way, it took us three hours!!! We went to the B&B and had dinner (subway) then we went to bed. 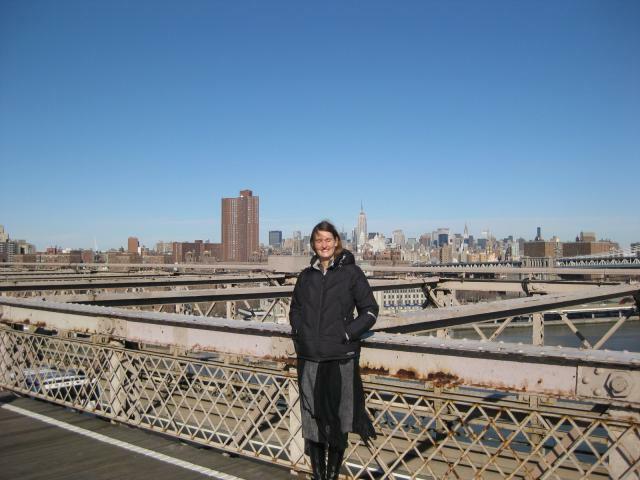 In the morning we had a nice breakfast there, then we went to the brooklyn brige, we walked on it! 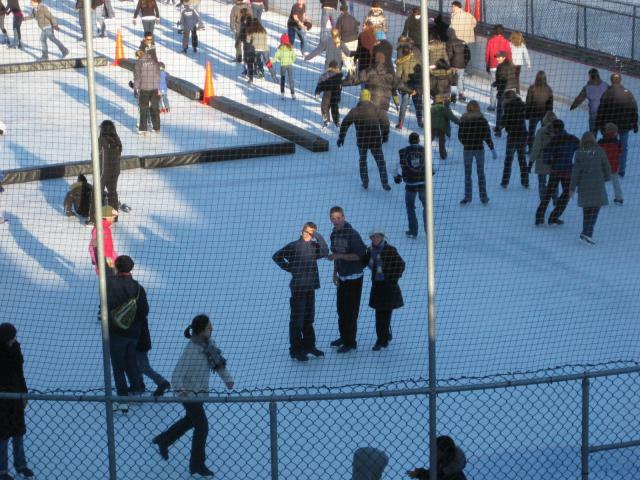 Then we went to central park and ice-skated, that was fun! Then we went to time square, it was crazy there, there were ssssssooooooo many people there!! 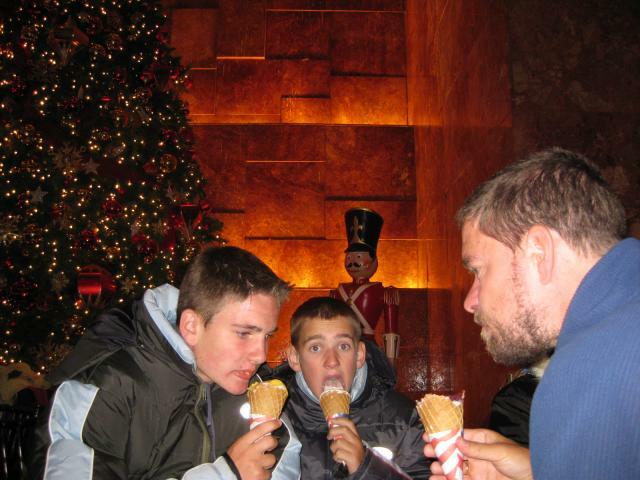 Then we went to trump tower and had ice-cream! That was so cool! On Wednesday we where going to go to the statue of liberty but it was way to busy, any we had aready seen it from the ferry. Then we went shopping, I bought some clothes and some books, and then we went to chinatown!!!! 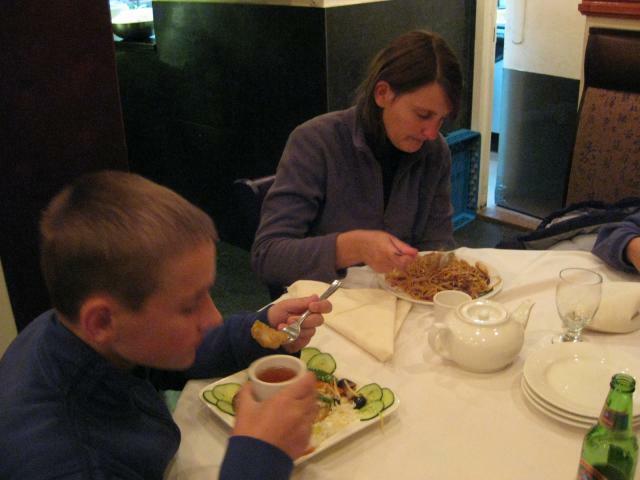 We had an alright dinner at this chines resturant, then went back to the B&B. 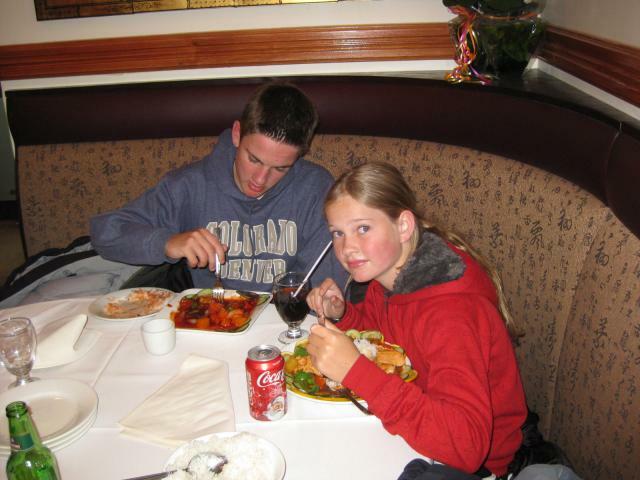 On Thursday (today) we had breakfast and then we got ready to go to the ariport, the taxi arrived and we were off. We arrived and cheked in and all that, now here I am! Happy New Year everyone! I have been sick for the last few days, so I have a lot a catch-up. 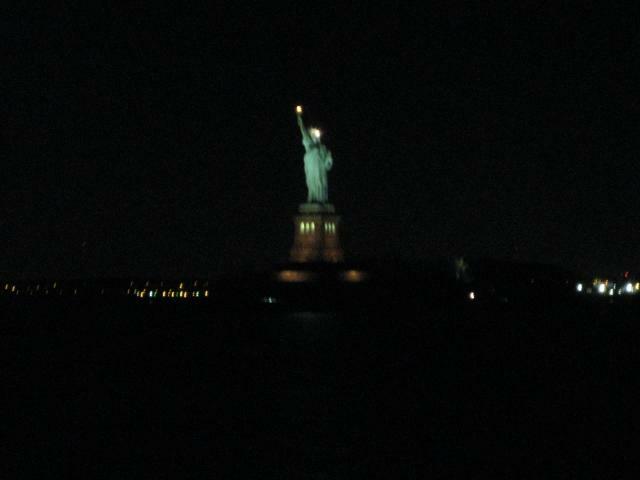 On Tuesday we took the ferry to Manhattan, past the Statue of Liberty. 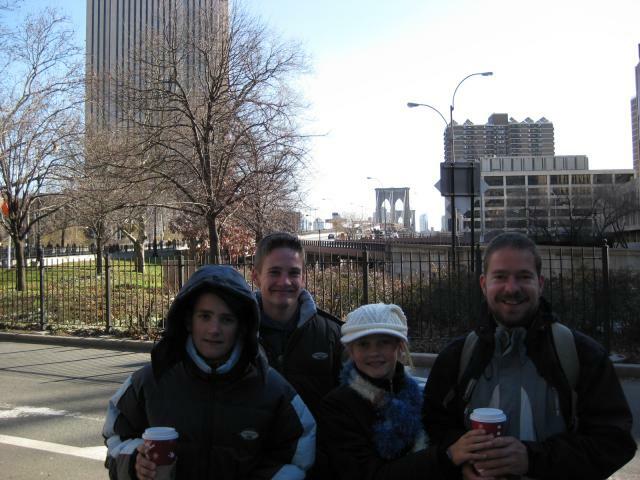 Once there, we visited the Brooklyn Bridge (we stopped by Starbucks on the way). 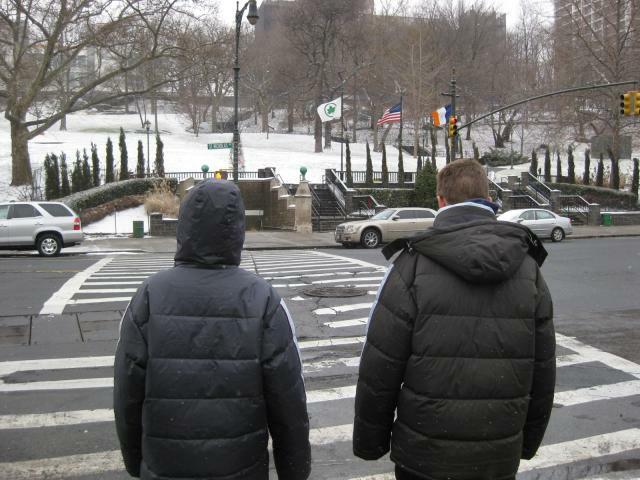 Next we went to Central Park. We also went iceskating in Central Park. Then we went to Times Square and walked towards Trump Tower. We passed a Chirstmas tree on the way. 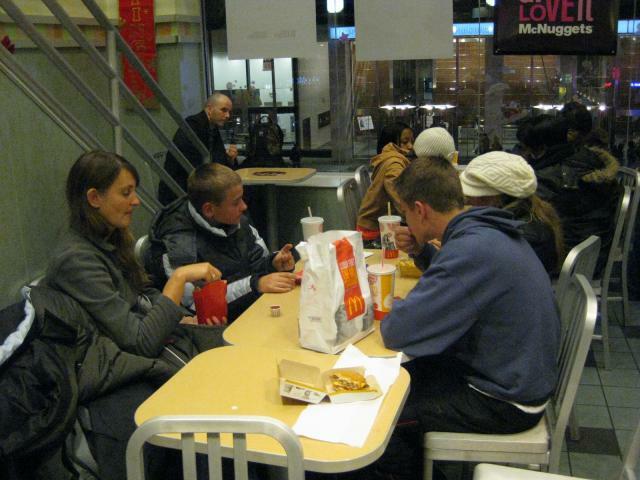 We had McDonalds for dinner (it was suprisingly hard to find). And finally we went to Trump Tower and had some Trump Icecream (yummy). We had dinner in chinatown, and then went back to Staten Island. 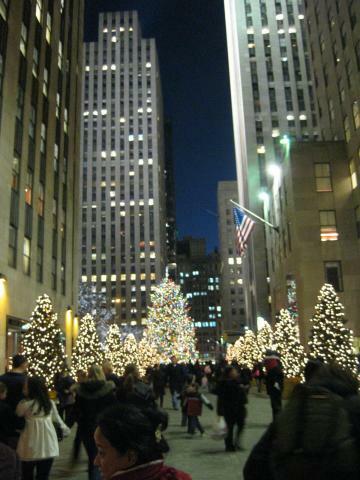 We didn't stay in Times Square for New Years, as we read it would be very bussy. I also read there would be over 1000 cops, and counter-snipers on every rooftop. It must have been very secure. We hebben hier in New York geen goede wireless, zodoende niet veel blogs. Ook zijn we savonds meestal laat, dus is er niet veel puf meer om wat te schrijven. Laat ik nog even bij Washington verdergaan: zondagochtend naar de kerk geweest bij de Reformed Presbyterian Church. Ik had het thuis al op internet gevonden en was heel opgewonden dat er een soortgelijke kerk hier bestond. Ze hebben de Westminster Confession of Faith en houden de erediensten op gelijke wijze als onze Free Presbyterian Church of Scotland. Alleen de Psalmen worden gezongen, zonder begeleiding van instrumenten en de preken zijn op reformatorisch grondslag. Het is vrij uniek om zo'n kerk te vinden. Na de dienst was er nog zondagsschool voor de kinderen en de volwassenen hadden een keus om Bijbelstudie over de Spreuken te doen of om catechisatieonderwijs te volgen. Er waren zo'n 80 mensen. Na de Bijbelstudie werden we uitgenodigd voor lunch door een familie, meerder families kwamen en we hadden een goede tijd samen. Maandagochtend terug naar New York gereden, we zijn door 5 staten gekomen: Virginia, Maryland, Delaware, New Jersey, New York. 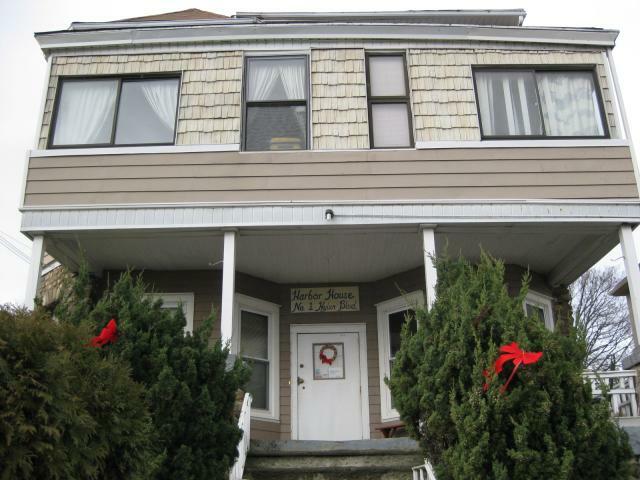 In NY aangekomen zijn we de uitdaging aangegaan om met het openbaar vervoer naar onze bed & breakfast te reizen. Eerst dus met de airtrain, toen de trein naar Penn Station genomen, vandaar de metro naar South Ferry, toen de Ferry naar Staten Island, vandaar een bus naar onze b&b. 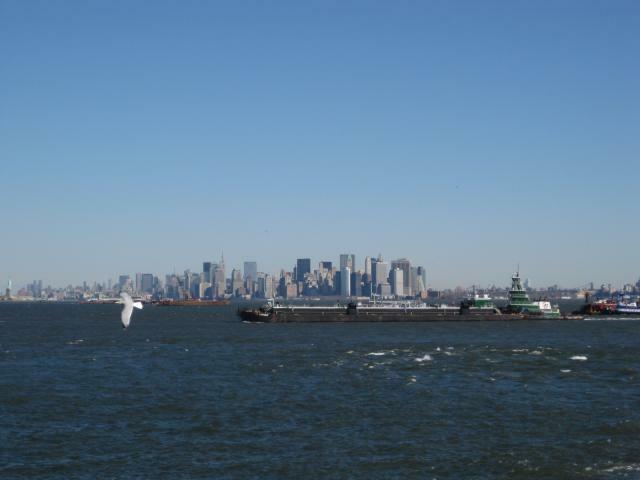 Een hele missie..........Toen we daar aankwamen hoorden we dat een taxi maar $50 kostte......Terug toch maar een taxi nemen:-) B&B was erg leuk, een oud huis met een prachtig uitzicht over de Hudson Bay en de skyline van New York. Duidelijk is grote gat wat de Twin Towers hebben gelaten. Sochtends lekker ontbijt. Keuze uit bagels, croissants, toast, cereals. Veel gedaan die dag. 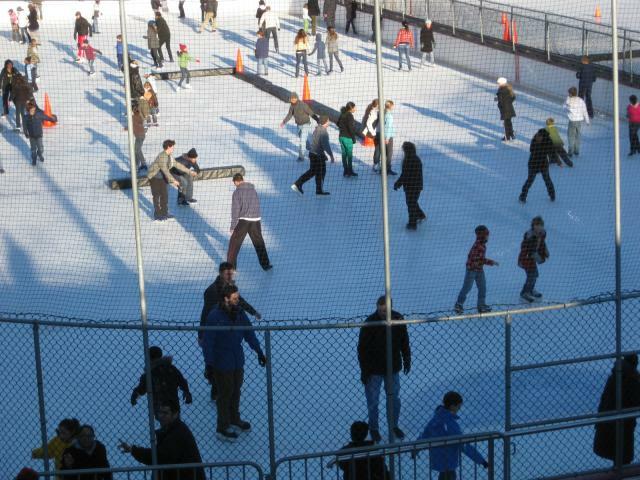 De Brooklyn Bridge overgelopen, naar Central Park geweest en veel gewandeld en waar de kinderen 1.5 uur geschaatst hebben! Vandaar naar Broadway en Times Square. Een hele belevenis. Maar ga nooit rond kerst of oud en nieuw hier heen. Het is zo verschrikkelijk druk. We snappen er niks van, want het is ook nog eens zoooo koud. We wilden natuurlijk ook nog even naar Trump Tower waar we Donalds' icecream hebben geproefd, mmmm. Alles is groots hier en mooi verlicht vooral rond deze tijd. Vanochtend wilden we Ellis Island en het Vrijheidsbeeld graag bezoeken. Maar de wachttijd voor de boot was 1.5 uur en bij het vrijheidsbeeld stond ook een lange rij. Toch maar niet gedaan, we komen met de boot naar onze B&B elke dag langs het Vrijheidsbeeld dus daar gaan we geen uren op wachten om het dichterbij te zien. Nog even wat gewinkeld, souveniertjes gekocht en naar Chinatown gegaan. Daar lekker chinees gegeten. Geen foto's dus, die plaatsen we DV in Nederland er wel bij als het internet wat beter is. On Sunday we went to the Trinity Free Presbyterian Church. My dad wrote a whole story about it. Today we drove to New York again. 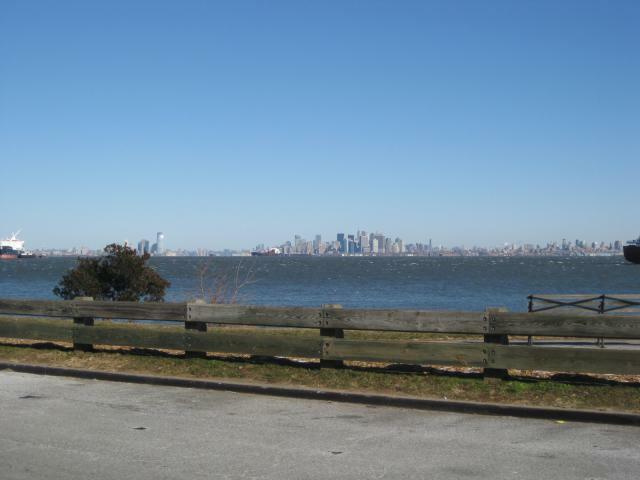 We dropt off the car and took a train, a bus, the metro, and a ferry to Staten Island. We had Subway for dinner. Today we went from Washington to New York. First thing in the morning we packed up and then we drove to Washington which took about 4 hours and a bit. 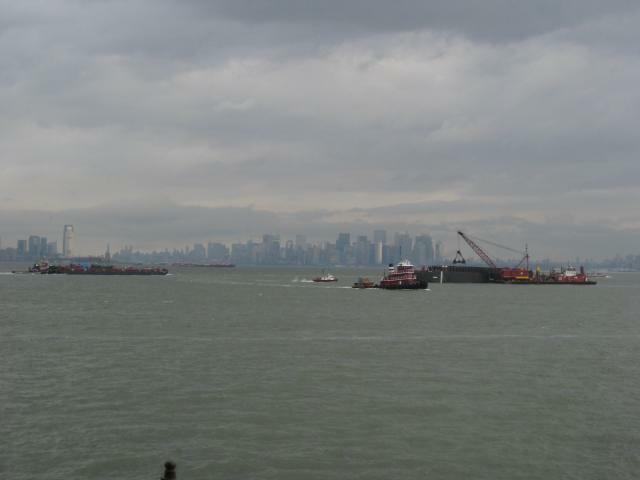 When we arrived we took the car back from where it came and then set out to go to Staten Island. First we had to take the train which costed us $15 USD per person which is an aweful lot. Then we took the metro which costed us $2 USD per person. After that we took the ferry which thankfully was free. 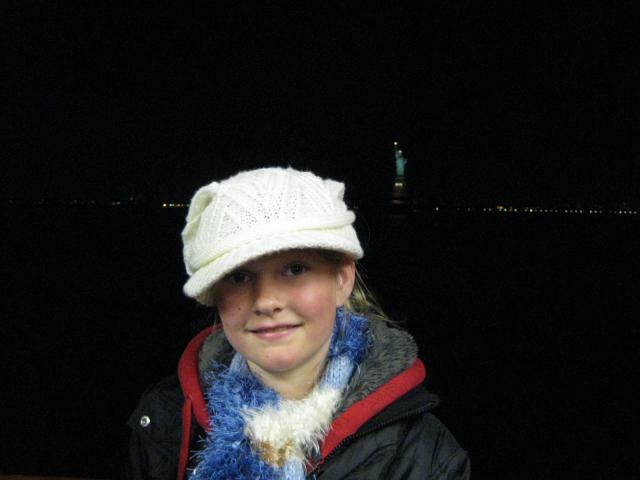 The ferry was cool and we went past the Statue of Liberty and we saw a bit of New York from the water. Then we took the bus the rest of the way, the bus was also free. And finally we walked the last 200 or so meters. Remember we did all this with our luggage on our backs. Im sure we lost a couple of kilos. Then we arrived at the hostel or Bed and Breakfast (which looks alright so far). We had Subway for dinner.